At the SRIA, we specialise in a number of areas of reinforced concrete usage. The SRIA brings to both industry and the general public the current best-practice in these areas. This service is achieved through a constant process of monitoring current projects, methods and research world-wide. Combined with our knowledge of, and contact with, the Australian building industry, we provide a unique resource for designers, specifiers and builders. 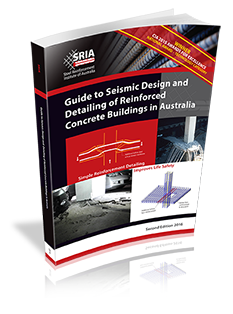 The SRIA National Office provides free publications on a number of areas of reinforced concrete construction to architects, engineers, builders, government and members of the public within Australia. This section contains an extensive collection of resources including publications, lectures, papers, technical notes, research and other data. Use of the site and its resources is subject to terms and conditions. Disclaimer: The Steel Reinforcement Institute of Australia is a national non profit organisation providing information on the many uses of steel reinforcement and reinforced concrete. Since the information provided is intended for general guidance only, and in no way replaces the services of professional consultants on particular projects or subjects, no legal liability can be accepted for its use.